Look for Love in The Junction!!! Look for Love in all the right places! 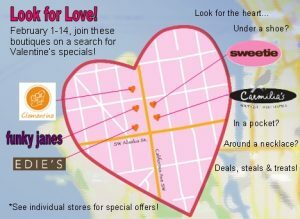 Join Clementine, funky janes, Sweetie, Carmilia’s and Edie’s from Feb 1st through Feb 14th on a hunt for Valentine’s deals. *Promotions vary at each boutique, but may include: final markdowns, gift with purchase, and special Valentine’s deals.